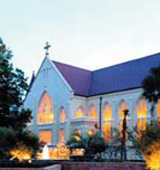 Spring Hill College, located in Mobile, AL, offers a liberal arts and sciences education and is affiliated with the Roman Catholic Church. The school enrolls about 1,700 students and offers free tutoring to students who need it. For recreation, Spring Hill offers a wide variety of alternatives, including a Club Sailing team. What are the top 3 reasons someone should attend Spring Hill College? The top three reasons that someone should attend Spring Hill College are the engaging learning environment, the welcoming and helpful faculty and students, and the beauty that can be seen everywhere on campus. What is a typical Spring Hill College student like? Describe the type of person that should attend Spring Hill College. A typical Spring Hill College Student is hard-working and engaged in the learning environment; helps the community; and is sociable, friendly, and welcoming. Spring Hill College is the oldest Catholic college in the Southeast, the third oldest Jesuit college and the fifth oldest Catholic college in the United States. Ranked among the top 20 Southern colleges and universities in U.S. News & World Report's "America's Best Colleges," its mission is to form students to become responsible leaders in service to others. We accept students from all religious denominations. What are the top 3 things that students do for fun at Spring Hill College? Campus housing is available for undergraduates. Housing deposit : $150.00. Housing deposit due : Jun 1. Housing deposit is refundable in full if student does not enroll.. Freshman allowed to have car. No pets. Rev. Richard P. Salmi, S.J. 81% of students graduated in the top half of their class. The average student pays $20,757 for tuition, fees, and other expenses, after grants and scholarships. Total stated tuition is $29,054, in-state and on-campus, before financial aid. Learn more about financial aid at http://www.shc.edu/finaid. Estimate the net price for you at http://www.shc.edu/ug/tuition-and-financial-aid/resources/net-price-calculator. 47% of students graduated on time. Spring Hill College participates in the NAIA Division I for college athletics. Want more info about Spring Hill College? Get free advice from education experts and Noodle community members. How large is the Greek Life Community at Spring Hill College?